MainAll NewsDefense/Middle EastCarter Guilty of Consumer Fraud? Carter Guilty of Consumer Fraud? 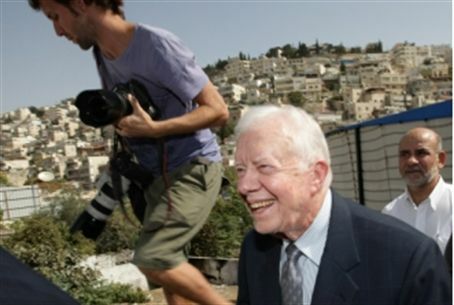 Interview: Jimmy Carter can say what he wants, but when he presents false claims as accurate, he's going to get sued, says filing attorney. Among the errors in the book, says Darshan-Leitner, is Carter's misrepresentation of UN Security Council Resolutions 242 and 336, which he cites as proof that Israel must withdraw to the 1949 armistice lines. “Even a child reading the documents will note that the resolutions say 'withdraw from land,' not 'all the land' captured in 1967,” Darshan-Leitner says. Carter wrote this despite the fact that Lord Caradon (British diplomat Hugh M. Foot), who authored the resolution, specifically stated that this was not the intent of the resolution. In a discussion in the House of Commons in 1969, Caradon said that “it would have been wrong to demand that Israel return to its positions of June 4, 1967, because those positions were undesirable and artificial.” The suit cites this and numerous other quotes by Caradon and others affirming this fact.